EX-SDI PTZ dome cameras provide pan, tilt and zoom functions, enabling wide area coverage and great details when zooming in. High-speed, precision 1/3" 2 mega-pixel PTZ control, in resolutions up to Ultra High Definition 2000p and x432 Zoom Control (36x optical zoom, 12x digital zoom). Digital Noise Reduction (2D +3D) and Digital Image Stabliser. Day & Night with IR Cut Filter. Intelligent IR LED Control range of 300m. Endless 360° Endless Pan Rotation with preset speed of 240°/sec. A wide range of accessories are available, including joystick for easy maneuvering and mounting kits for indoor/outdoor installations. 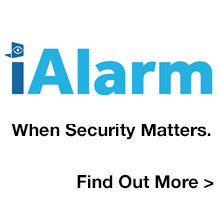 Statistics suggest that a property with a security alarm system is less likely to be burgled than a property without an alarm system and if you have a monitored alarm system, you should be entitled to a discount on your contents insurance. Contact us, or give us a call now on 0417 384 787 and we can discuss your individual requirements.